253rd day of the year. There were then 112 days left in 2018. 82nd day of Summer. There were 12 days left till Fall. September 10, 2018 was the 2nd day of Rosh Hashana (Jewish Observance). 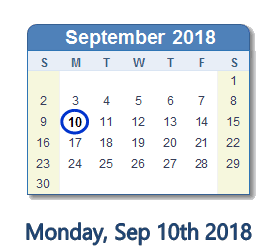 What happened on September 10th 2018? Whom will be believed: Trump or Woodward? fear was the absence of love and fear was the source of all of our evil. love was the absence of fear and love was the source of all of our greatness.